We all get phone calls from someone whom we really like but never see saying, “Hey!! Listen, I’m on your side of town just finishing up some Christmas shopping and thought I’d stop by for a quick visit IF THAT’S OKAY.” Well, hopefully you like this person. If you don’t exclaim how you’d LOVE to see them, it’s been SO long since you’ve gotten together, but you’re just walking out the door to pick up ____ (fill in the blank here) at the airport and we have to go straight from the airport to ____’s (again fill in the blank here) party, an imaginary colleague is totally fine, but we NEED to get together. Really. When things settle down. That’s if you’re not crazy about the caller. But if it’s your sorority sister that you absolutely ADORE even tho you’re awful at calling and keeping in touch, (I love you, Lor! )… well, I’ve got a super fast, super easy hors d’oeuvre for you. I try to make it a point to have certain ingredients on hand at all times especially during the holidays. And these are some of them. This is a FOUR (4) ingredient stunner. Camarones al Diablo, Deviled Shrimp. They’re pretty, easy to handle and go perfectly with a glass of wine or champagne or a stronger spirit. They’re most excellent at Christmas but also in the dead heat and humidity of summer. You don’t necessarily need to use Harissa. Hot curry paste or Thai hot pepper paste would be great. The same for Vietnamese or Korean. All hot pastes work. Keep these ingredients on hand and you and your guests will be happy, happy, happy! Now pour me a glass of that champagne you’ve been saving. yield: as many as you make! large, extra-large or jumbo shrimp with tails intact, that’s the handle to hold on when eating. harissa, a hot, spicy paste from North Africa and the Middle East found in most ethnic markets. It usually comes in small tins. 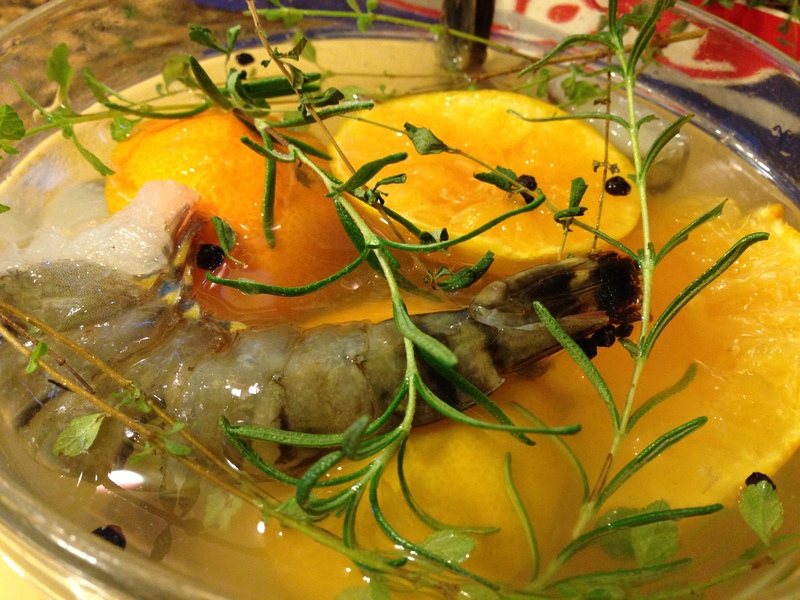 Make a brine for your shrimp with what you have on hand. I used a few tablespoons of sugar and salt. A few whole peppercorns were thrown in. I didn’t want to use a whole navel orange so I halved two clementines. Squeeze them and then throw in the shells. Who doesn’t have those around at Christmas? I threw in some fresh and dried oregano and then a few fresh rosemary sprigs. Use what you have on hand. Lemons, limes, oranges, tangerines, ANY fresh herbs and then add your salt, sugar and peppercorns. While your shrimp is brining get everything else in place. Open your harissa, melt your butter and open the phyllo. Cover the phyllo with a clean, damp tea towel. Remember, phyllo sheets dry quickly so, again, have everything in place. When ready to assemble, pat shrimp dry with paper towels. Take one sheet of phyllo and fold in half lengthwise. Fold again lengthwise. At one end place one teaspoon of Harissa. Place one shrimp over Harissa with tail sticking out to be your “handle”. 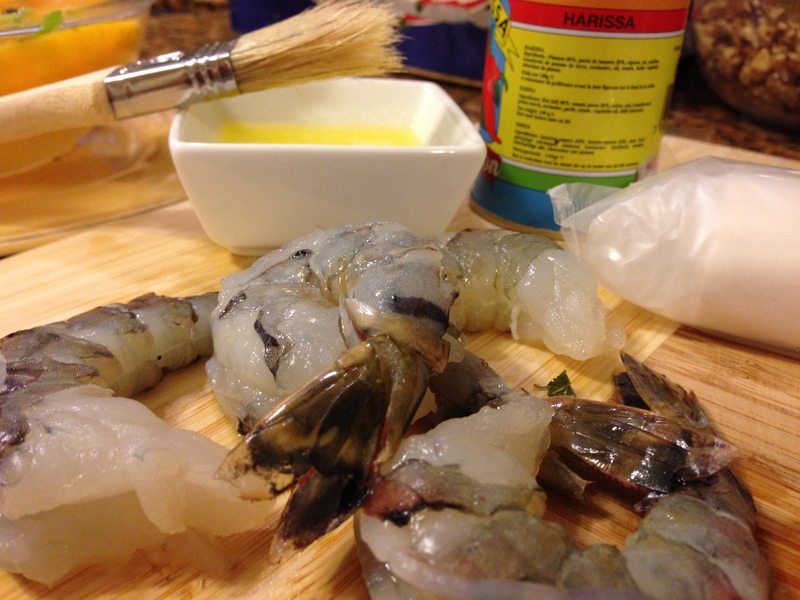 From the shrimp to the opposite end of the phyllo brush with butter. 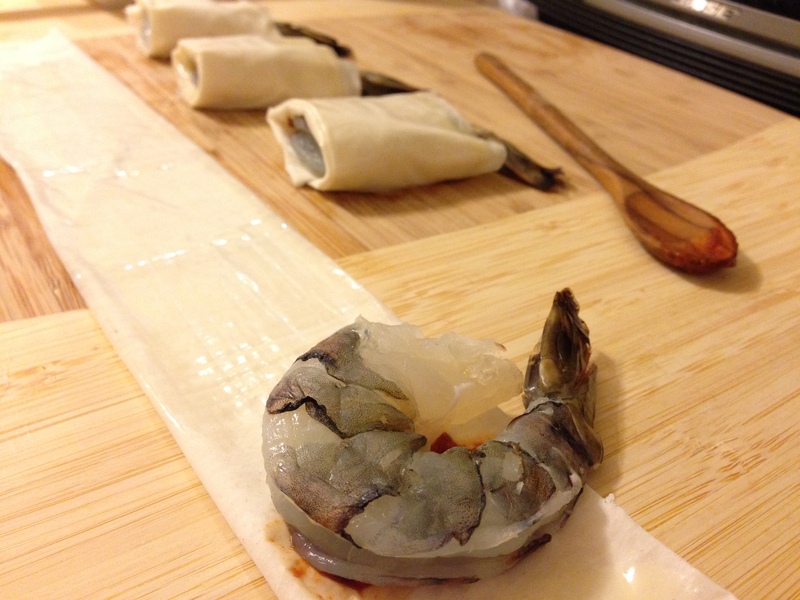 Starting at the shrimp end roll to make a small packet but stop maybe two to three inches from the end. If you use all the phyllo the appetizer gets too “doughy”. Cut off the excess phyllo. Brush the top of your “packet” with butter. Place on tin foil lined baking sheet. Continue rolling the rest of the shrimp until you’ve finished the number you want. Bake for 10-12 minutes depending on the size of your shrimp. 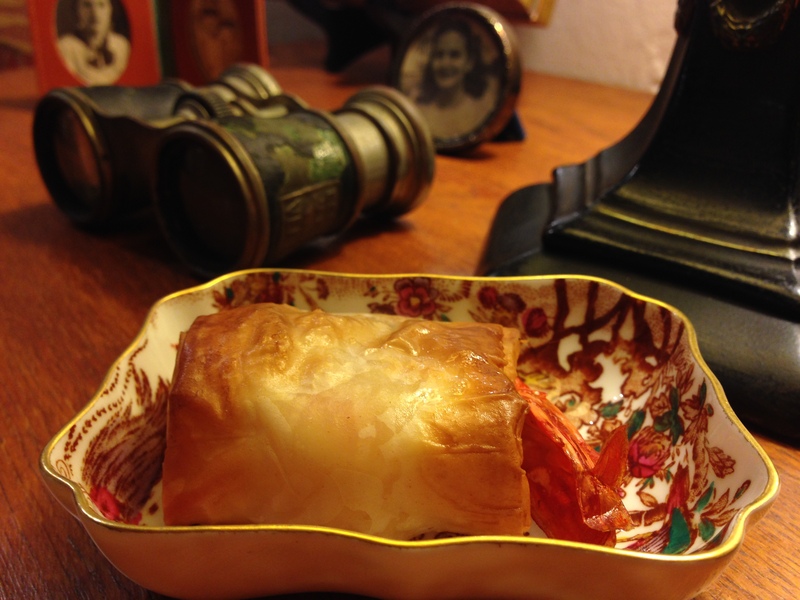 When the shrimp is opaque and the phyllo is golden remove from the oven and serve immediately. I’m on my way to the store now for these ingredients. Thanks for saving my menu again. Looks delicious and oh so elegant! Why, it’s my pleasure and I’m SO pleased!! !